AHX is a protracker-like music editor that was designed especially to create C64-like synthetic tunes. There is no support for sampled instruments as chip tunes are made to be as small in size as possible. So an average AHX tune has a length of about 200 bytes - 5 kbytes (unpacked). All waveforms of the C64 are supported: Triangle, Sawtooth, Square and White Noise. Also Hi-/Lo-Pass filtering effects are supported (ring-modulation is hopefully to come in AHXv3). 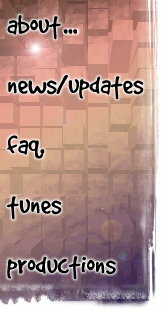 Check out the News/Updates-Page for the changes in the current version! Fixed some minor bugs and added some little features. Refer to the History file please. Fully Protracker keyboard-compatible track editor featuring variable pattern-length, single-voice patterns, Protracker-Module-Import and Optimize-function. Powerful synthetic instruments-editor featuring all C64 waveforms as triangle, sawtooth, square and white noise. Instrument-specific apreggio-/macro list featuring fixed/variable notes. Player features: square modulation, vibrato control, note slide, transpose, hi-/lo-pass filter, hardcut, multiple speed CIA, 68000-compatible, supports using your own cia for multiple speed modules now! Built in AmigaGuide help; internal help system to explain all commands etc. AmigaOS-compliant: uses ASL- and Intuition-Requesters. Fully controlable via keyboard, no long mouse-movements needed. Player for Delitracker (using DeliTracker's NotePlayer system) shipped. Binary-/Assembler-/BlitzBasicII-Player for your own productions included, AmosPro-Player, E-Module and C/C++ Module available (see Productions page for links). This is where you can edit all parameters of the current instrument, including instrument arpeggio/macro list, waveform, vibrato control, square- and filter-modulation, the well-known ADSR envelope, hardcut control. Many people requested a preferences editor, so Dexter finally implemented one. You can now set the default songs and instruments directory, VBL/CIA-IRQ, Allocation of audio channels (via audio.device), pt.font in file requesters and the colors of the Volume meters, cursor and rastertime display. *THE BUG* That the prefs-requester doesn't work on some configurations is NOT my fault, it's GadToolsBox's fault. The prefs routines will never be rewritten due to leck of time! Anyway Pink's extern prefs-exe is included, and after using this once, the intern prefs do also work, weird, but that's it. Check it out. For WinAHX for Win95/NT and WinAHX for WinAmp 2.0+ please visit the WinAHX page!